I wrote about this passage in my book God Shows No Partiality: “hypocrite” is a Greek word that meant stage-actor, and for the first Gospel writers it would have carried several negative connotations that they associated with Greek theater. Because both Christians and non-Christians use the word so much, it has lost it’s ability to connote these other meanings. 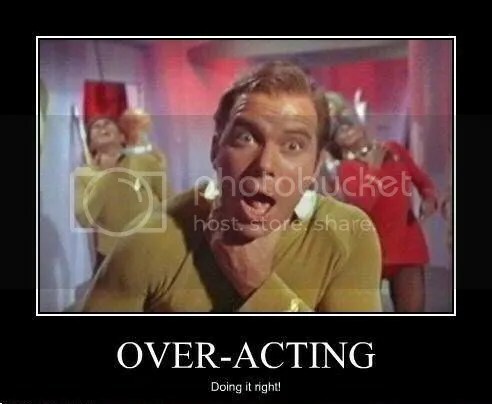 So I started thinking, what if we translated “hypocrite” as “drama queen?” Imagine Jesus saying to today’s Christians, “Woe to you fundamentalists, you drama queens!” The phrase “drama queen” connotes both acting and overacting. It can include manufactured outrage, religious posturing, or disapproval at people who break religious regulations. It connotes the shocking gender and sexual ambiguity that was present in first century theater (where men played women’s roles, and theater people were associated with lax morality) as well as the modern implication of some kind of personality disorder. Religious drama queens have a deep personal need for attention and approval, either from God or from their social group. They love stories in which they are an oppressed minority. For them, the world is always about to end. The president or the pope or Lady Gaga are the anti-Christ. For preachers who rail against homosexuality, the phrase “drama queen” points out that they may have their own gender and sexuality issues. It’s too easy for Christian holy-rollers to shrug off being called hypocrites, and it’s too easy for non-Christians to slap the hypocrite label on religious people without thinking of how it applies to themselves. One common sermon illustration is the person who says they don’t go to church because it’s full of hypocrites. The pastor replies: “We’ve always got room for one more.” Both religious and non-religious people can be drama queens. You can be a religious or a non-religious drama queen any time you build yourself up by showing others what a lifestyle diva you are: praying in the marketplace, as Jesus said, or publicly lamenting whatever it is trendy to lament, or manufacturing outrage over someone else’s misstep. Their are eco-drama queens, and second amendment drama queens, and vegetarian drama queens, and libertarian drama queens. In this way, hypocrisy is not only about saying one thing and doing another. It’s the whole practice of blowing tiny things, even irrelevant things, out of proportion. The Pharisees were taking a few verses from the Bible about religious purity for priests (who were supposed to wash their hands and feet before serving in the Temple) and applying it to all people in all situations. Today, religious drama queens take all kinds of scriptures out of context, or make up new restrictions that they say follow logically from other scriptures, and teach them as God’s Will for All Humankind. Jesus says that such people are not really following God. They are drama queens. As we begin forming Saint Junia, our new United Methodist Church in Birmingham, I think we need to establish early on a “no drama” rule. Not the theater arts, obviously, which are hugely important, but the bad drama of moralistic posturing and religious politics. The idea is to walk with God humbly, recognizing that it’s very easy for us to cross the line from authenticity to overacting without ever realizing it. Saint Junia UMC has a vision: We are becoming a diverse community of sinners, saints, and skeptics who join God in the renewal of all things. We also have a mission, five ways to join God in the renewal of all things: Worship, devotion, compassion, justice, and witness. Our next task will be to describe our core values. I think it’s great to see the ways some families are also identifying their core values and putting them in their homes. When we locate a venue in Birmingham for our church, I’d like to see us do something similar. I’d enjoy seeing our core values rendered as art on the walls. As I’ve said before, I believe in an inclusive gospel. This is not rooted in “political correctness.” It is rooted in the decisive action of God in Jesus Christ, the definitive move God made to step into our human flesh, confront the power of human sin with love instead of violence, and claim victory over death. It is an affirmation that God shows no partiality as both our judge and advocate. The best picture we have of God is Jesus, who in his ministry identified himself and the image of God with anyone in need. I also value the world that God loves. Our actions should honor the created world, not abuse or exploit it. And I value the people that God loves. Every human being is someone’s baby. Someone invested time and energy in that person, and God invested the totality of God’s own self in them as well. When we treat them as obstacles, or nuisances, or parasites, we demean what God has done. Each one has potential that can only be tapped when they start living the abundant life available to them. I value the Bible. I love this book. It is not just a map or a set of instructions. It is not free of contradictions, and words like “inerrant” or “infallible” reduce its poetry to a set of bullet points in somebody’s sales pitch. It is a living dialogue between God and humanity, and it invites us into the life of God. I want to read it the way some people read trashy romance novels or kids read comic books under the covers with a flashlight, to dog ear its pages, to run my fingers over the paper and put its poetry in my soul. I want read it until its images are burned into my eyes, so that everything I see I view through a theological lens. One composer said, “People have been taught to respect music, when they should have been taught to love it.” I feel the same way about the Bible. I value shared meals. Meals have been used to exclude (Genesis 43:32, Galatians 2:11-12, and Chick-fil-A). At the center of the Christian story is a shared meal. That’s where some of the best church happens. I value singing. In a world where music has become something you consume, and where people compete on American Idol and judges mock people’s voices, we have all been convinced that we cannot sing, I value a community that lets us find our voices. We all make music. We need to learn to hear it. But as we wrestled with the topic, we kept coming back to the question: what does “authenticity” actually mean? Is it something you can measure? Everyone participates in “social discourses,” meaning that you are trying to be a certain kind of person. How you dress, how you talk, what you consume, all of it communicates information to the people around you. Nobody gets to opt out of social discourses. “Normal” or “regular” are also social discourses. It’s why you don’t see more men wearing kilts or togas in Birmingham. When you do, you think, “Hey, what’s he trying to say?” But every man wearing shorts is also “saying” something. Part of authenticity is if you can “pull off” being a certain kind of person in a convincing way. My friend Bill had this insight: In such a community, I can have a sense of authenticity when I can say, “This is who I am in the midst of who we are.” I can clearly state the kind of person I am trying to be. I do not feel that I have to walk on eggshells around other people, that I’m going to somehow hurt the group with my own identity if I disagree with someone, or if I don’t live up to their—or my—own expectations. In fact, I relish being held accountable. In such a community with a clear mission, I can have my own mission as well, and other people are helping me achieve it.